My favourite jelly shoes right now, see where to get them below. Do you remember the jelly sandals from the 90s? They are back and they don't come alone. While I am the biggest fan of the label Melissa and wear jelly shoes since I heard about their existence as a teenager, this year jelly shoes seem to invade the streets and are everybody's darling. A lot of labels supply us with shiny, pretty shoes, made of plastic. They are comfortable, don't mind getting wet and spread summer feelings immediately. Here I show you a little selection of the prettiest jellys I've spotted for you. I counted 20 pairs of jelly shoes on my shoe shelf right now and I tell you, this addiction is unstoppable. If you don't have any jelly shoes, now the time is right. No matter if you go for comfortable sandals, beach-style flip flops or elegant high heels: Jelly Shoes have to be part of your summer dream this year. 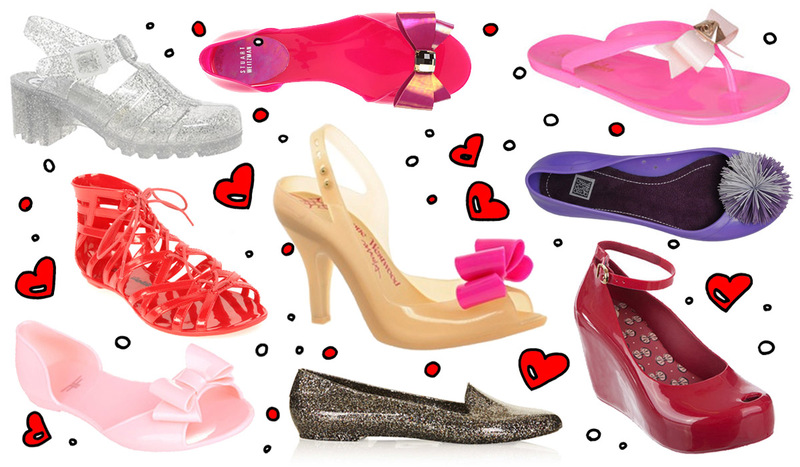 Will you go for jelly shoes this season and which one? There is still time to enter my Sugar & Vice give away. Boom! Here comes a fruit and colour splash. 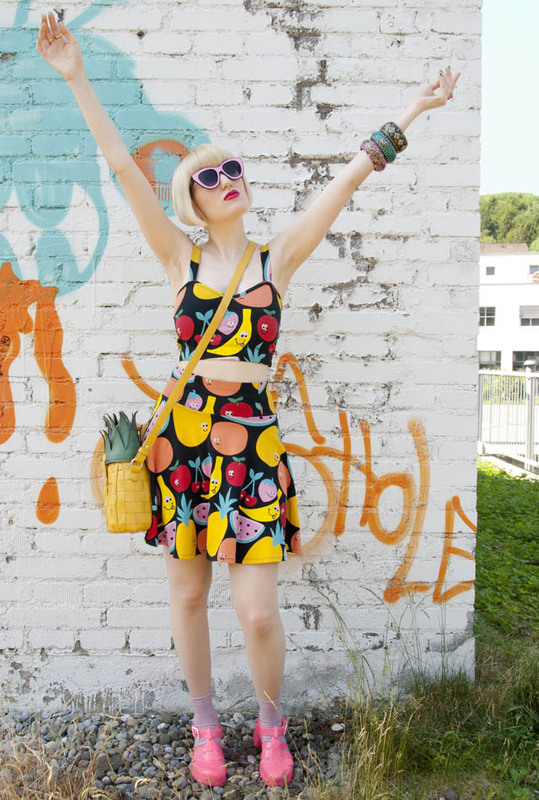 I want to be a comic book heroine who saves the world with fruit power. At least this sunglasses give me the look of a cartoon girl. I wanna have a pile of fruits this big. What do mosaics and fruit have in common? They fit together! 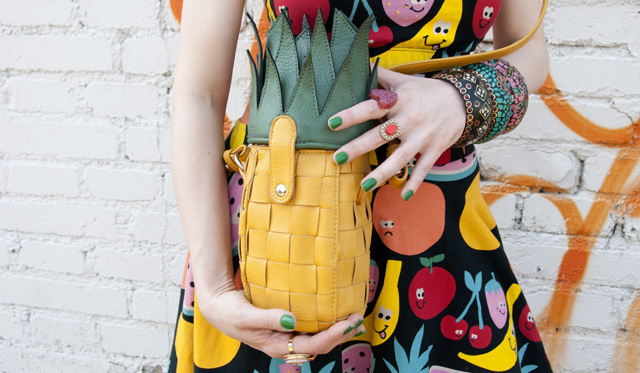 Yes, I do carry around my mobile and purse inside a pineapple. The hot summer weather turns me more and more into a joyful fruit. While many of you might struggle to eat their five a day, I manage to fit many more fruits into my outfit. It was love at first sight, me and this outfit from the Lazy Oaf x Nasty Gal collection. The colourful fruits with their happy and sad faces seemed to shout "Take me, take me" into my ears. This summer it's a big trend to have matching skirts and cropped tops/bralets. You know that I don't follow headless every trend, but this one suits my taste perfectly. I matched my clothes with sunglasses from Quay Eyeware to enhance the comic style look. Quay is my one and only favourite shop for glasses at the moment. You will get bold glasses in good quality for reasonable prices from them. 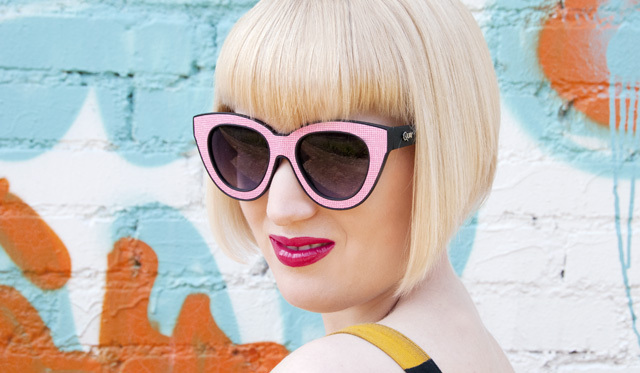 Not just me, but as well stars like Gwen Stefani, Lady Gaga or Kelly Osbourne love the trendy glasses from the Australian label. Last but not least, let's talk about jewellery: Time for opulence! 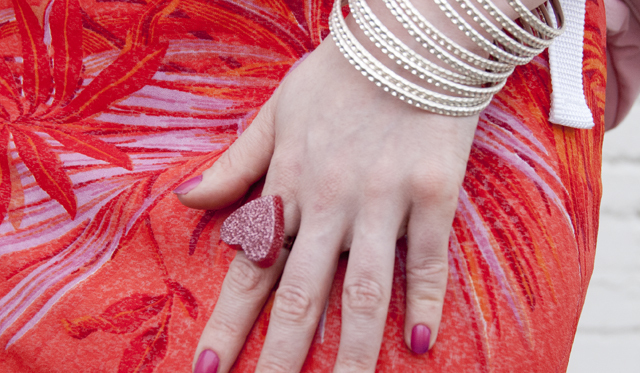 I got the bangles and rings (except the heart ring) as a gift from lovely Tessa from the blog Fashionresister. We girls do a little swapping from time to time and send each other surprise packages. This time we choose the topic "Holidays and Around the World" and Tessa's parcel was all inspired by Barcelona. She said the bangles reminded her of the work of the artist Gaudi and I think they spread a huge dose of Mediterranean spirit. I imagine they might come from the place where happy fruits grow. So my lovely readers, I hope you had your five a day and your mind is full of colours. I am very curious to hear your opinion about this look. Don't forget to enter my Sugar & Vice give away and stay tuned for more Lazy Oaf looks. 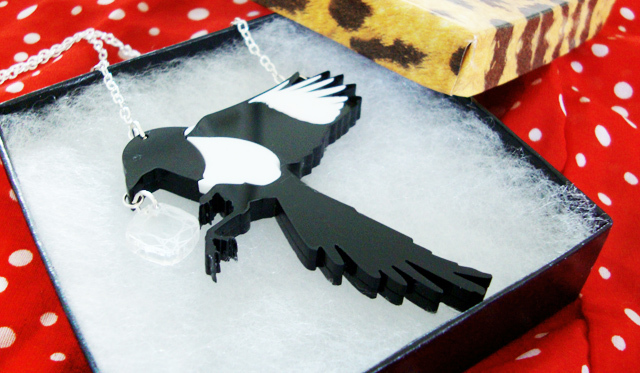 With a little bit of luck, this magpie will soon fly into your jewellery box. There is a sweet Sugar & Vice charm attached to the chain. It comes in a beautiful box and hopefully will make you happy. The thing I love most: Time for a give away! One lucky winner will get this pretty magpie necklace from Sugar & Vice, one of my favourite independent jewellery shops. 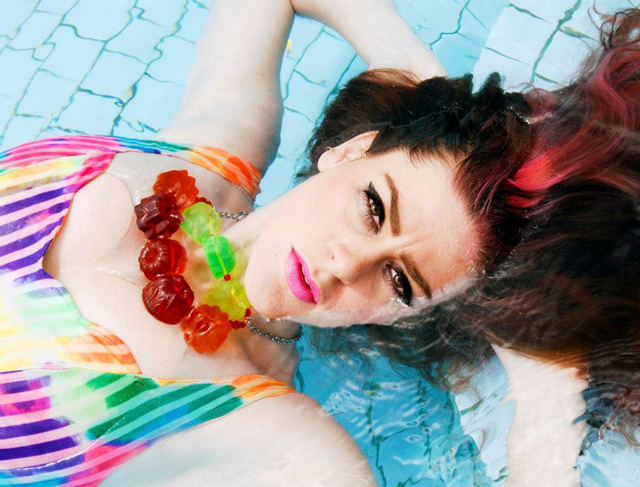 Sugar & Vice constantly creates new quirky jewellery designs and as well clothes. Very soon they will release a 90's jewellery collection and I am sure this one will awake nostalgic feelings. If you enter their online shop, you find yourself in a colourful world of fun with very affordable prizes. As you have seen in my last outfit post, they have wonderful name necklaces. You can choose the word, colour and font of your necklace. Custom orders are very welcome too and will be taken from the extraordinary Sugar & Vice team. When I could choose one item as a give away, it was a tough decision, because everything Sugar & Vice sells is so beautiful. 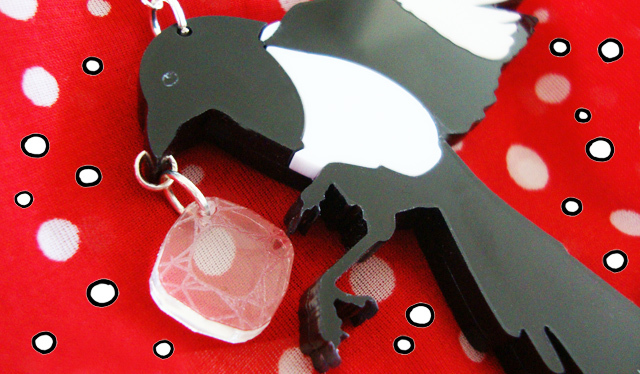 I choose this magpie, because I love the graphic look of the cute magpie carriying it's pretty diamond. It wil be the eyecatcher of many outfits for sure. So what do you think, do you wanna call this necklace yours? 2. Leave a comment on this post with your email address or your twitter name, so I can get in touch with you in case you win. The competition closes at Sunday 7th July 2013, midnight CET and is open worldwide. The winner will be contacted via twitter or email. I wish you good luck and hope the magpie will be a good friend to a stunning girl. Thanks a lot to Sugar & Vice for sponsoring this give away. Today it's time for a lot of pink – fifty shades of pink. 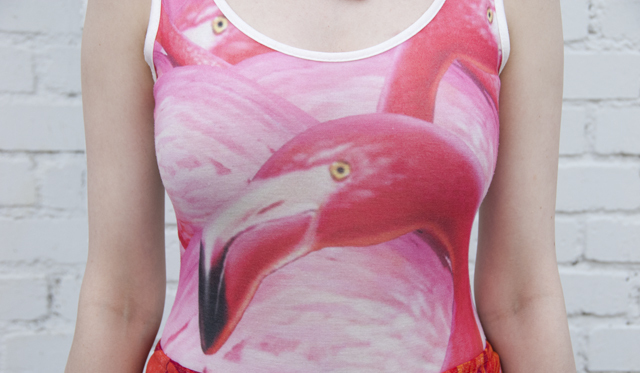 Not just flamingos have pink wings, but my backpack too. 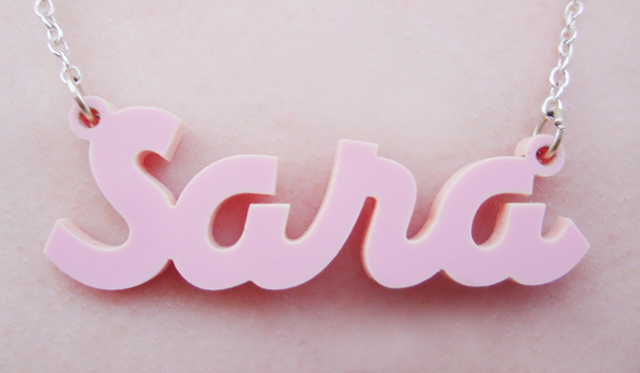 Isn't this the sweetest colour ever for a name necklace? Mister flamingo thinks so too and nods. Gosh, I feel like in a world full of candy floss. Everything is bright, sparkling and cute. 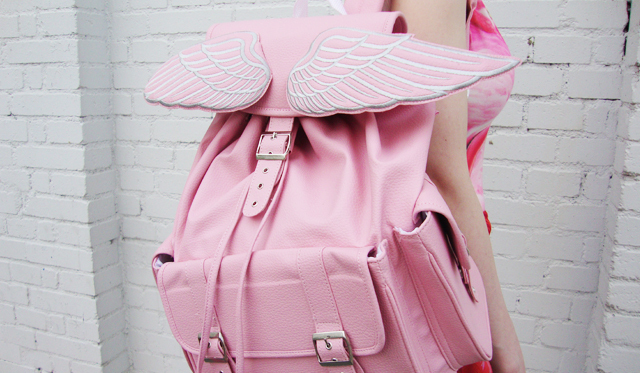 This is probably the only backpack I will ever consider as absolutely stunning. A barbie dream come true with the cutest wings. This shoes are described as "Hipster mermaid shoes", I agree and love them. Whenever I travel by bus or train, I spot many copies of the book "Fifty Shades of Gray". I haven't read it and I certainly never will, but every time I read the title it makes me a little bit sad. I imagine all this shades of gray next to each other and think, how much more beautiful fifty shades of any other colour would be. Fifty shades of gray sounds like a lot of boredom to me and like the complete absence of every excitement. When I put on today's outfit with all it's shades of pink, the title "Fifty Shades of Pink" popped into my mind immediately. Don't you agree this is far more fun than gray? Pink and orange is a combination I didn't try very often before, but I like how they enhance and contrast each other. I am in love with every piece I wear and hope you see it in the pictures. What on earth can beat holographic shoes, a winged backpack and a flamingo bodysuit together in one outfit? My look is inspired by the creative outfits of the girls in Harajuku. I think especially the shoes and backpack express the cuteness of this kind of style very well. The first time I saw this backpack was on a Tokyo style blog and since then I couldn't stop thinking about it, till I could call it my own. From now on I wear my name around my neck. This name necklace was a very sweet unexpected gift from Sugar & Vice and since it arrived I don't know how I could have been without it. I love the colour of the perspex and maybe with this people will finally understand that my name is spelled without an "h" at the end. If it doesn't work, I don't mind if people just remember me as the pink candy floss girl instead. Now you have to excuse me, I need to spread my wings and discover a few fluffy clouds. What do you think about this outfit my lovely readers? Thanks a lot Sugar & Vice for sending me this beautiful name necklace. I wear it every day since it arrived. 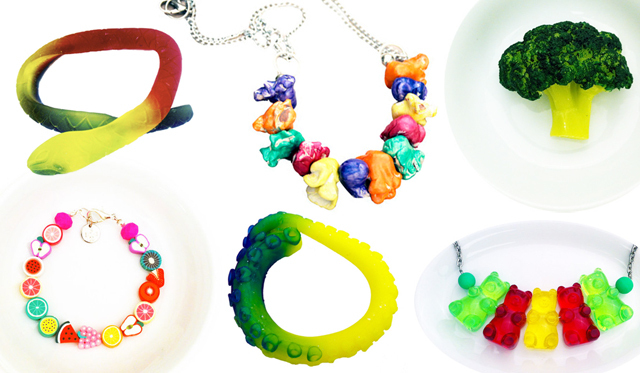 Eat.Me.Do is a world full of colourful and mouthwatering jewellery. Each piece looks like a tasty menu or a piece of food and there is something to serve everybody's cravings. From broccoli, cherry pie, squid, Fruit Loops and pasta, everything what Eat.Me.Do turns into jewellery is a feast for the eyes. You might be tempted to put the beautiful things in your mouth, but beware: It looks to good to eat and therefore is made to last and sate your appetite for stylish fashion accessories day after day. Melbourne based Designer Lara Ivachev is the creative mind behind the label Eat.Me.Do. 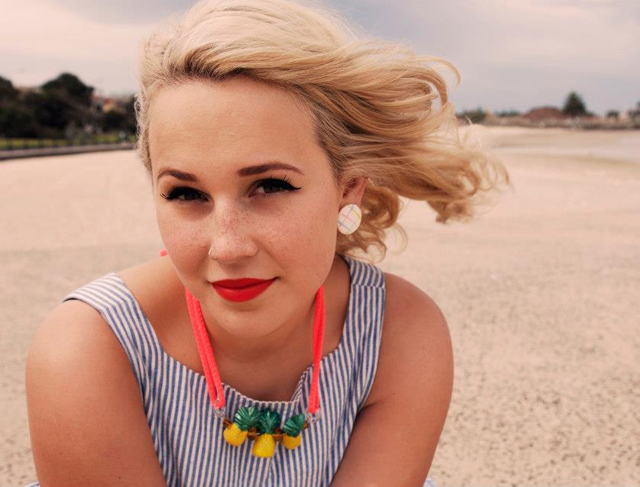 After graduating with an advertising degree, Lara started in June 2012 to create handcrafted jewellery made from clay. After being moulded, the jewellery is baked in an oven and hand painted. Customer orders are welcome as well, just tell Lara about your favourite meal. Lara is the right person to turn all your dreams of chicken tikka and banana split into a tasty statement piece. 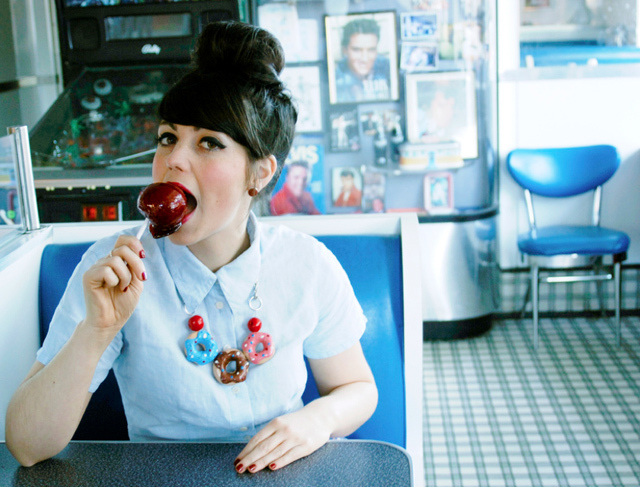 I adore that the jewellery from Eat.Me.Do looks so playful and happy. I believe everybody who sees this jewellery must immediately feel the love it was made with. All the pieces are extremely appetizing, yet this sweets are neither bad for your teeth, nor do they have any calories. Hi Lara, did you dream of making food jewellery for your whole life or how did this idea start? No I never dreamed of making food jewellery at all. I always had a love for quirky, bright things...it came about after I discovered how much I enjoyed making the pieces and how much people loved them. No one wanted to give me a job,so I created my own. What was the first piece of food you ever turned into jewellery? The first food I ever turned into food was actually a string of banana! They were so fun and colourful! What inspires you for your work? I am inspired by anything quirky,bright,sparkly and 60's inspired. I have a fetish for all things glittery and bubbly. What is the connection between food and fashion in your opinion? The connection between food and fashion in my eyes is the beautiful colours and somewhat novelty quality of food in fashion. I'm attracted to different and unique ways of using food in a wearable way that makes people fall in love. What is your the menu of your dreams? My dream menu would be one filled with mountains of sparkles,whipped cream,fruit and glazed cherries. I have a cheeky sweet tooth and can't go past a sugar coated treat. Did this wheat your appetite for this delicious jewellery? Then go and visit Eat.Me.Do's page. Copyright of all pictures by Eat.Me.Do. …love is in the air. If there is a beautiful Pearls & Swine fascinator involved, the romance is perfect. Fashion heaven is on earth today. The cutest Peter Pan collar ever. Who said that black flowers are not lovely? That is a lie! The cats love to play games on my tights. Skirt and top are perfectly matched. Same buttons, same fabric. Kitty loves it to I bet. Everybody who knows Sweeney Todd, remembers Miss Lovett and her worst pies of London. No worries, I don't show you bad pies here, but lovely clothing from another Miss Lovett. This is definitely not the worst fashion of Mannheim (Germany). 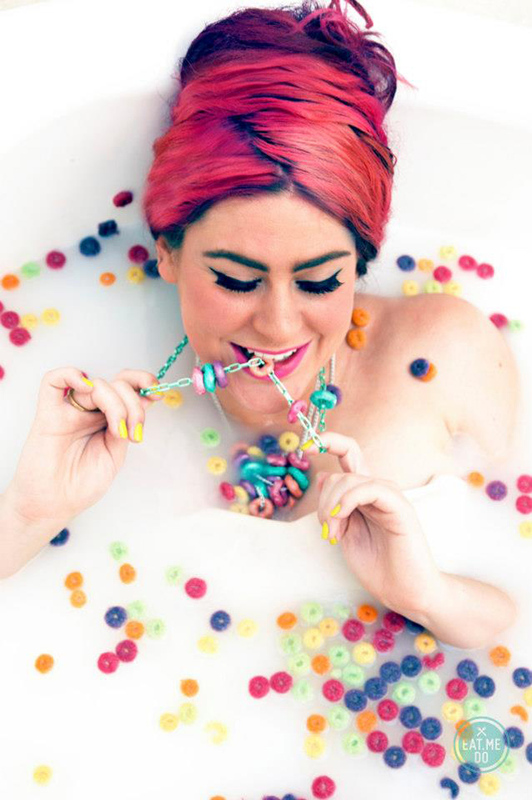 What Miss Lovett designs is a mixture of rock n'roll and cuteness. Everything is handmade with love. The top and skirt I am wearing are from the "A Kiss from Miss Ivi" collection, Miss Lovett's latest masterstroke. When I opened the parcel, I was excited. The pieces look cue and feminine and are very comfortable to wear. The fit is perfect, even for curvy girls like me. I love the cute Peter Pan collar of the top and the puffy sleeves. The skirt matches the top perfectly with the red stripe and the same buttons. The colour combination of black and red is one of my favourites and made me fall head over heel for this outfit. I recommend you, to pair outfits like this with a beautiful fascinator, high heels and red lipstick. Probably you can also go for false lashes like I did, to make the look even more dramatic. If you go out for dinner or have a date, it's just perfect. I am absolutely convinced by this outfit and already lusting after more pieces from Miss Lovett. You can pay a visit to the shop as well and treat yourself with something. You will find no bad pie in this shop for sure. Thanks a lot Miss Lovett for providing skirt and top for this outfit and as well lovely thanks to Pearls & Swine for the fascinator.